Guy Fuhrman before the 4th round of CCCR Championship. Oct. 28, 2015. Two of the best active players in Rochester, Lev Paciorkowski (left) and David Campbell battled for a point in Round #4 of the CCCR Chess Club Championship. After a "titanic battle", Lev won the game. If you are unable to play a round, please notify the tournament director as early as possible by calling the Chess Center at 585-442-2430 as early as possible. This is greatly appreciated. A no-show forfeit removes the player from the tournament. Zero-point byes are available. Players: Please see Mike Lionti to submit a PGN file or to have a photocopy made of your chess game so it can be posted online. 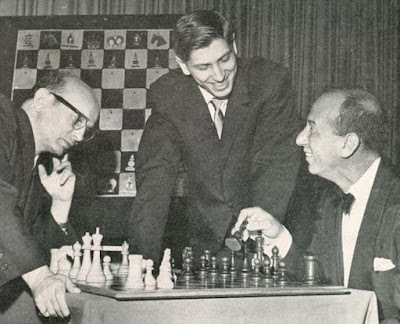 In 1st place, in a three-way tie, we have Cliff Kharroubi, Lev Paciorkowski and Ken McBride. Ken defeated last year's defending 2014 club champion Webster Kehoe in the 4th round. We have completed four rounds out of five in this year's annual CCCR Club Championship. The complete results can be found below in the tournament cross-table. We started the 4th round on Wednesday night with only one undefeated player, David Campbell. Campbell lost his game to Lev Paciorkoswki in an exciting game. Now, no player in the tournament stands with a perfect score. 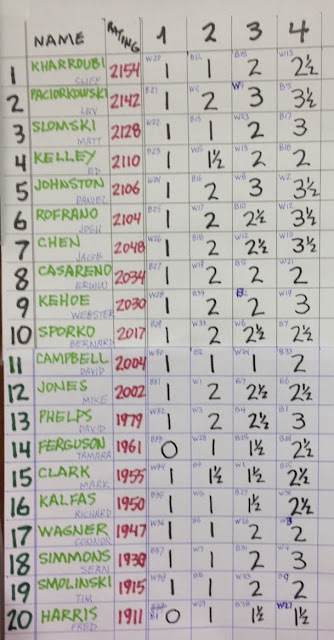 This year's 19th annual Chess Club Championship has now completed 4 rounds. The tournament is being held at the Rochester Chess Center, in Rochester, NY. The tournament consists of five rounds over five consecutive Wednesday nights. Round three was held on Wednesday night, Oct. 21st, 2015. 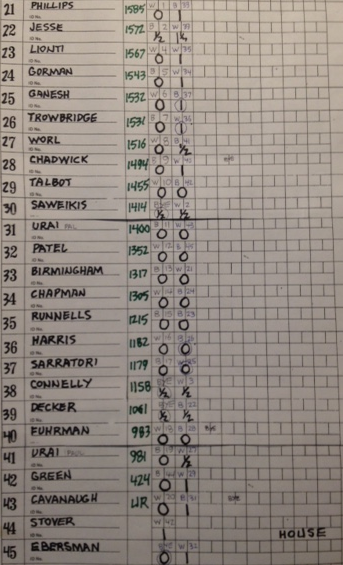 Photographs and some chess score sheets are now posted in the gallery (see link below). Ron Lohrman is the tournament director. Mike Lionti is the organizer and assistant director. For more information, please contact us at 585-442-2430. The next round of the tournament is Wednesday night, Oct. 28, 2015. Participants should be in attendance by 7:15pm. Zero point byes are available if needed. Please notify the tournament director if you are unable to play so adjusted pairings can be made. It is greatly appreciated. 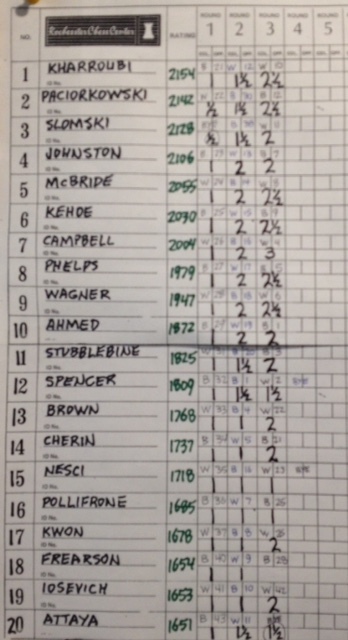 Photographs and copies of score sheets from the Club Championship are posted here. Update in-progress adding PGN games you can play thru right here from the Chess Blog. On BOARD #1, Lev Paciorkowski won his game against David Campbell. At this point, nobody has a perfect score. The chess battle now continues into the final round next week! Plan to have dinner at the Chess Center. round of the CCCR Championship, Nov. 4th! 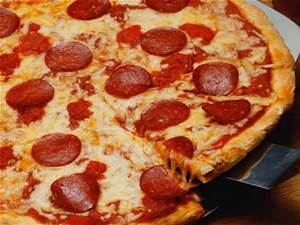 Join us for a pre-tournament supper! Gerry Birmingham enjoying his chess game during the Championship. Future Grandmaster Thomas Kwon is deep in thought during his game in the Championship. In 1st place all by himself, we have David Campbell (ranked 7th) with a perfect score with 3.0 points after three rounds. We have Cliff Kharroubi, Lev Paciorkowski, Ken McBride, defending 2014 club champion Webster Kehoe, David Phelps and Connor Wagner all tied for 2nd place with 2.5 points after three rounds in this year's CCCR Club Championship. By now, most of the players are very settled into this year's tournament and are trying their best to move up the ladder. There is a good number of top ranked players still battling for the top positions. There were several upsets as lower-rated players continued to challenge and get better games than their higher rated opponents. This is normal in tournaments, because most players are more focussed and determined. 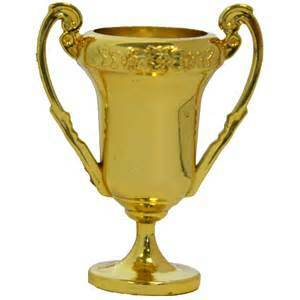 If a higher rated player is not giving it their best, upsets can occur. 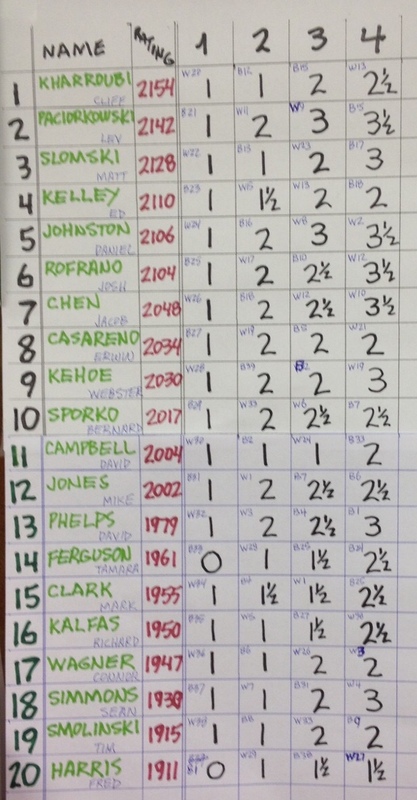 This year's 19th annual Chess Club Championship has now completed 3 rounds. The tournament is being held at the Rochester Chess Center, in Rochester, NY. The tournament consists of five rounds over five consecutive Wednesday nights. Round three was held on Wednesday night, Oct. 21st, 2015. 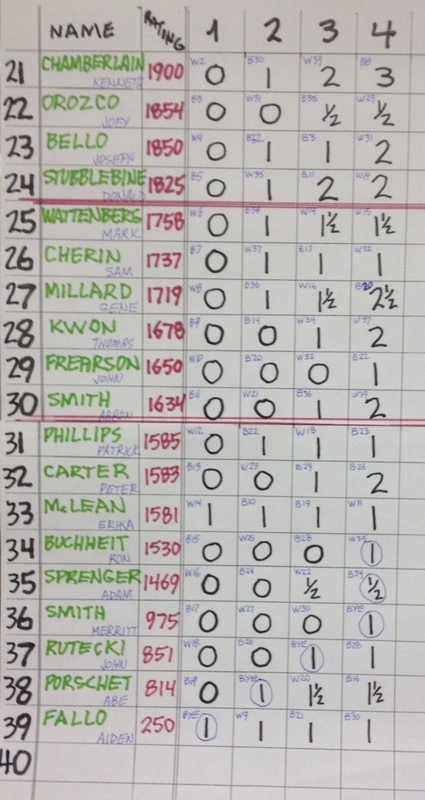 Photographs and some chess score sheets are now posted in the gallery (see link below). Ron Lohrman is the tournament director. Mike Lionti is the organizer and assistant director. For more information, please contact us at 585-442-2430. The next round of the tournament is Wednesday night, Oct. 28, 2015. Participants should be in attendance by 7:15pm. Zero point byes are available if needed. Please notify the tournament director if you are unable to play so adjusted pairings can be made. It is greatly appreciated. 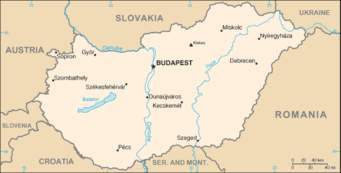 Here are some photos taken by Amy and Howard Decker when they visited a restaurant called "Chess" in Budapest, Hungary. 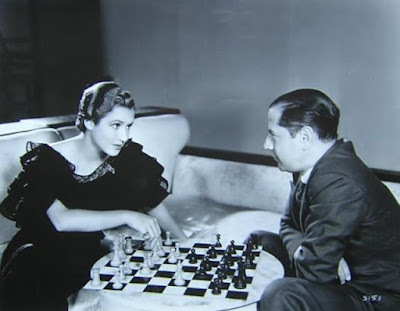 It turns out that it's a favorite of Susan Polgar's when she is there. And, best of all, Amy and Howard said the food was sensational. Thanks to Amy and Howard for sharing the photos with us for the blog. "When we walked in that evening, the host held up a large chess piece autographed by her. There were chess books and other items on the walls as well. And, as I said, the food was simply fabulous." If you are unable to play a round, please notify the tournament director as early as possible. 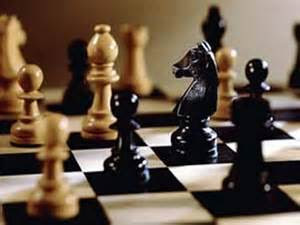 Players: Please submit a PGN file or a photocopy of your chess game so it can be posted online. 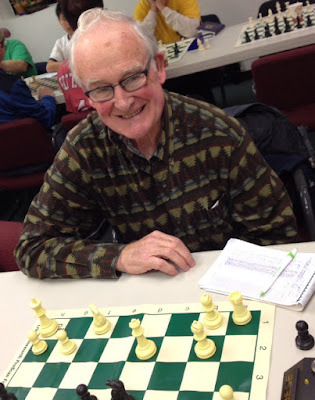 Guy Furhman at the Community Chess Club Championship. Oct. 14, 2015. Several players who had a first round bye joined this year's 19th annual Chess Club Championship. The tournament is being held at the Rochester Chess Center, in Rochester, NY. The tournament consists of five rounds over five consecutive Wednesday nights. Round two was held on Wednesday night, Oct. 14th, 2015. 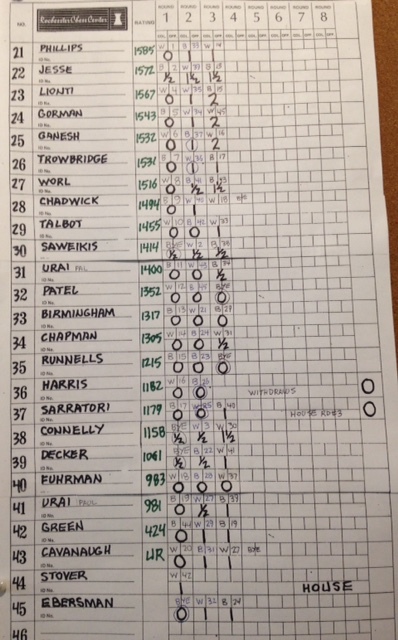 Photographs and some chess score sheets are now posted in the gallery (see link below). Ron Lohrman is the tournament director. Mike Lionti is the organizer and assistant director. For more information, please contact us at 585-442-2430. The next round of the tournament is Wednesday night, Oct. 21, 2015. Participants should be in attendance by 7:15pm. Zero point byes are available if needed. Please notify the tournament director if you are unable to play so adjusted pairings can be made. will be available shortly at the chess tour web site. Click here to see the results. 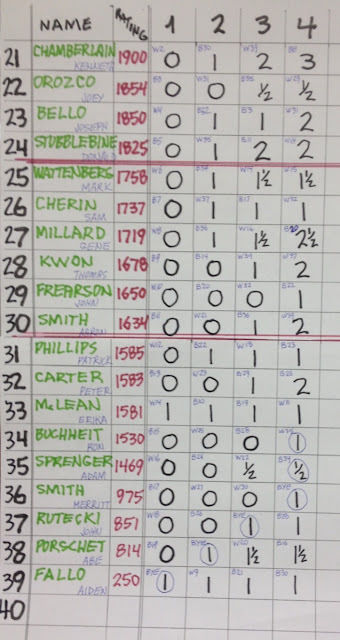 Ken Chamberlain is also posting round-by-round results. 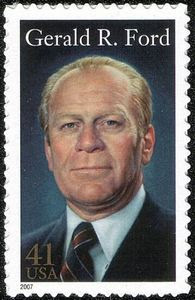 Former President Gerald Ford proclaimed and designated National Chess day in October 09, 1976. But before it happened there was a series of requests from other groups concerned including the Regional Vice-president of United States Chess Federation, who wrote a letter requesting about a proclamation of the said commemorative activity. He stated that roughly 30 million American's are playing chess and that it wasn't being recognized and honored as a great game. It was then reviewed and later, accepted. 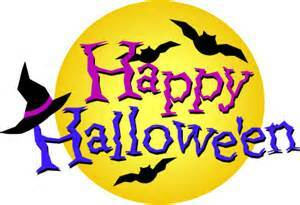 Since then, it is remembered every year, but has gradually faded away over the years because it wasn't official. 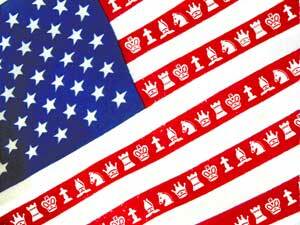 For the past several years, every 2nd Saturday of October has been declared National Chess Day by the U.S. Congress. 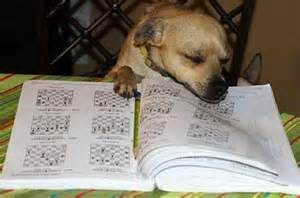 National Chess Day in 2014 is 11 October and National Chess Day in 2015 is October 10! 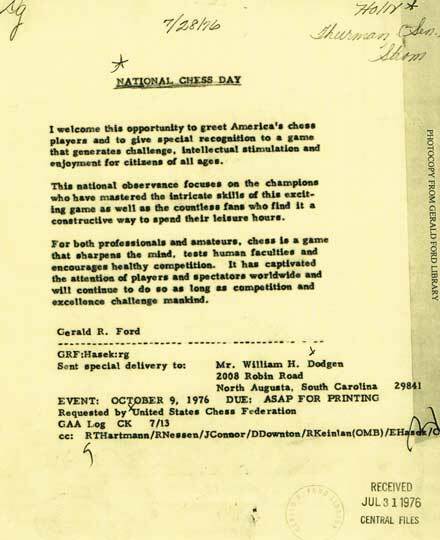 President Gerald Ford set the 2nd Saturday in October aside as a day "To give special recognition to a game that generates challenge, intellectual stimulation, and enjoyment for citizens of all ages." A record number of players are participating in this year's 19th annual Chess Club Championship, held at the Rochester Chess Center, in Rochester, NY. The tournament consists of five rounds over five consecutive Wednesday nights. Round one was held on Wednesday night, Oct. 7th, 2015. We have a wide range of players participating, from beginners to the best and most active players in Rochester, including Cliff Kharroubi, Daniel Johnston, Lev Paciorkowski, Matt Slomski, Ken McBride, defending 2014 club champion Webster Kehoe, and previous club Champions Doug Spencer and Don Stubblebine. The biggest upset so far was Brian Jesse's draw with chess expert Lev Paciorkowski. This is certain to be a great tournament. 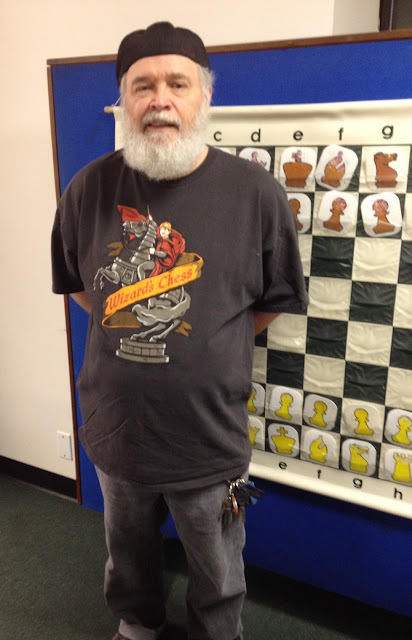 It was a full house of players including four new chess players who stopped by to join the USCF and play rated games. The club continues to grow, and could soon reach 70 members. Some photos from the first round games will be posted soon. Ron Lohrman is the tournament director. Mike Lionti is the organizer and assistant director. For more information, please contact us at 585-442-2430. The next round of the tournament is Wednesday night, Oct. 14, 2015. All participants should check-in with the tournament director by 7:15pm to confirm attendance. Photos from the Club Championship are posted here. 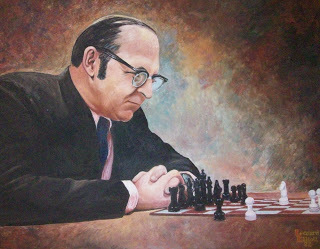 Dr. Erich Marchand "requested that his friends play chess in his memory." 5SS, G/120, d5. Location: Strong National Museum of Play, One Manhattan Square, Rochester, NY 14607. $16,440 Gtd. Open Section: $3000-2000-1300-800-500-300. Under 2200 & U2000 each $750-450. FIDE Rated EF: $85. U1800 Section: $1100-750-450. Under 1600 $750-450. EF: $70. U1400 Section: $500-300-200. Under 1200 $300-200. EF $60. U1000 Section: $400-250-160. Under 800 $200-130. EF: $50. Unrated players in the U1800 section can only win $375, in U1400 $175 & U1000 $125. No limit in Open. Balance to next prize winners. EF refunded and $100 appearance award to all GM and IM if paid by 3/5/2016. All EF add $20 after 3/5/2016. NYSCA members deduct $3. All sections USCF rated. Ratings as in March Supplement. Bring sets, boards, and clocks – none provided. Food court and chess books & equipment sales available on-site. No smoking allowed on The Strong campus. Free parking. Reg. : 8:30-9:15am. Rds. : Sat. 10-2:15-6:30, Sun. 10-2:15. One ½ point bye available in rd 1, 2, 3, or 4 if requested at entry. 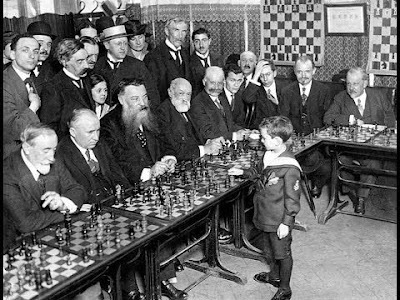 Optional first round Friday, 3/18/2016 at 7pm played at Rochester Chess Center (register by 6:30pm). Info: 585-442-2430. 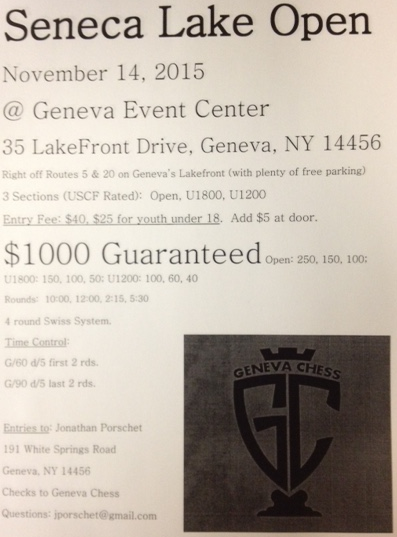 Mail entry to: Rochester Chess Center, 221 Norris Drive, Rochester, NY 14610. Web: nychess.org. Store: chessset.com. Also, don't forget the Chess Center now runs Sunday Quads from 2-6pm every week! Fourth episode of Chess Match where instructors from the Rochester Chess Center provide instructional videos sponsored by the Rochester Chess Center. Officiated by instructors Ken McBride and David Petty, instruction from matches include a first year players match between brothers David and Daniel Villani, and the final half of the advanced match between ranked players Webster Kehoe and Connor Wagner. Also, the TIP of the Match from each game and BENEFITS of the Day, and Chess Teams with competitions from around Rochester NY. McQuaid High and Middle, Wilson High, All City, SOTA, Harley, Gates-Chili, Arcadia. Look for your friends and look for yourself! New episodes every month with new players. See if your team, your club or your school, friends or acquaintances are on this episode. had a wonderful time last Saturday at The Little Theater. Some of us stayed after in the cafe and played chess for several hours. We gathered in the cafe for a quick photo to remember the occasion. We hope to see you at the NEXT special chess club event too! 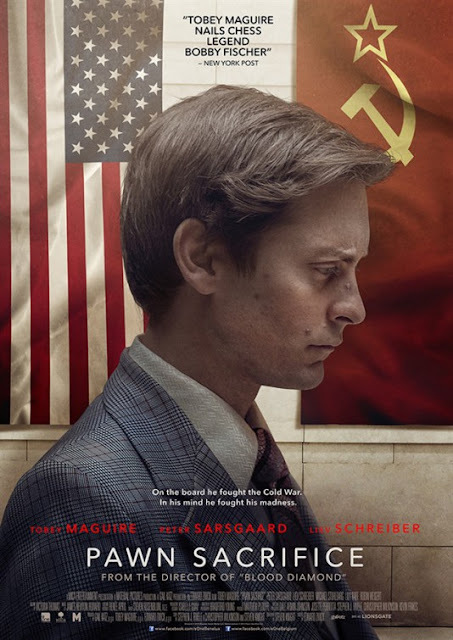 We all highly recommend the movie, Pawn Sacrifice! 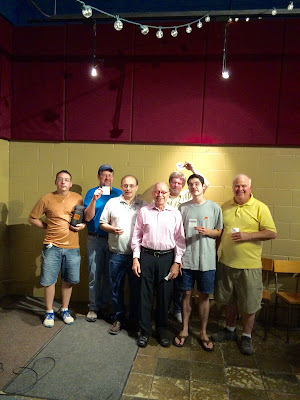 Sept. 26, 2015 - Club members at The Little Theater's showing of "Pawn Sacrifice"
"I'm dreaming of chess puzzles and dog biscuits"